From Gyeongju we traveled to Busan, a bustling port in the south of the country with plenty of US sailors everywhere – the USS Reagan had just docked, with 5,000 sailors on shore leave! Plus there were other USS ships in port at the same time. 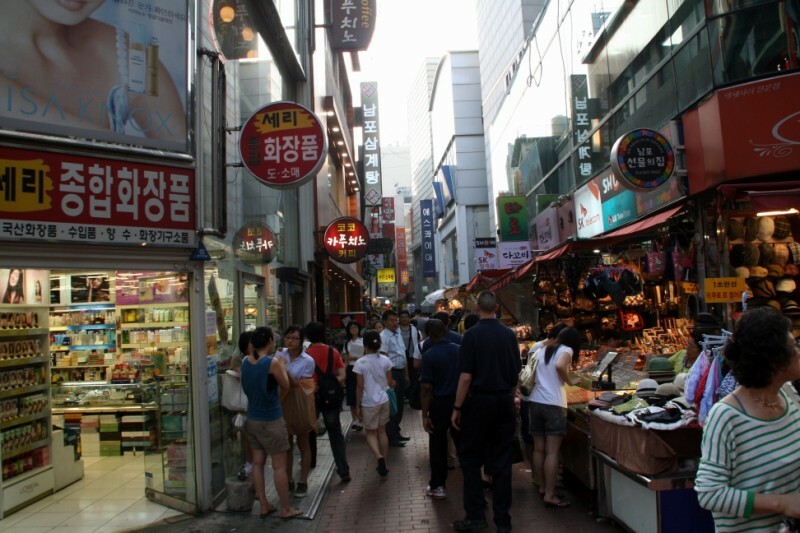 Downtown Busan - shopping in the evening. We had an amazing hotel room for $30 US (or 2 cents in every other currency), and were right downtown, central to everywhere. Which was lots of fun because Busan at night is ALIVE. 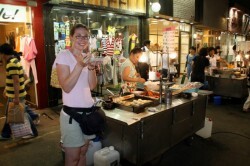 Lots of street vendors, the stores are open really late, lots of pedestrian areas and great people watching! 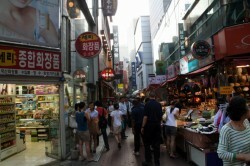 We did some great shopping in a huge market with great people watching. We ate dinner on the street – they set up carts and give you your food on a plastic plate that they put inside a new plastic bag for each customer. I had some vegetarian sushi (you get a huge amount for about $1US) and a potato and green onion “pancake” – yum! Ian ate some, um, interesting food, and when he showed interest in something else (pig intestines stuffed with blood, pork and vegetables – lovely), the lady of course gave him a free sample which was half a regular serving and refused payment – that’s happened to us all over Korea. People have been amazing. 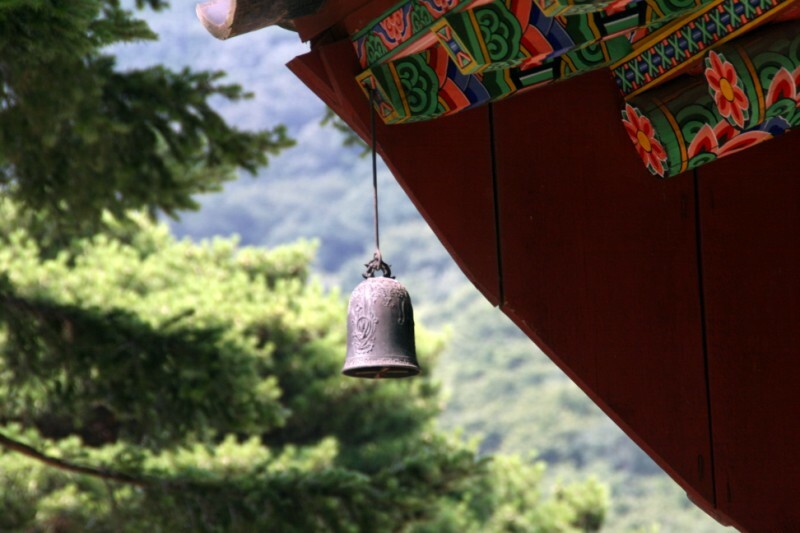 Bell hanging from one of the temple buildings. Beomeosa temple is simply awesome. It’s actually accessible by subway and then a connecting bus – so it was really easy to get to. Like most of the temples we saw, it’s set in a huge park. To reach the temple you first walk through a beautiful treed area and then you emerge into this clearing and there it is. It was built in 678 AD, and is impeccably maintained. We spent several hours there, enjoying the serenity and the beautiful buildings.